The latest SPAR, reporting on October 2018, is available on the System Price Analysis Report page of our website. The SPAR is our monthly report on Imbalance Pricing, and includes an overview and analysis of the previous month’s prices and pricing parameters. The SPAR aims to increase industry understanding of pricing, in light of the changes made as part of BSC Modification P305 ‘Electricity Balancing Significant Code Review developments’ implemented in November 2015. Further changes as part of P305 came into effect on 1 November 2018. System Prices following the November 2018 changes will be reported in the next edition of the SPAR. 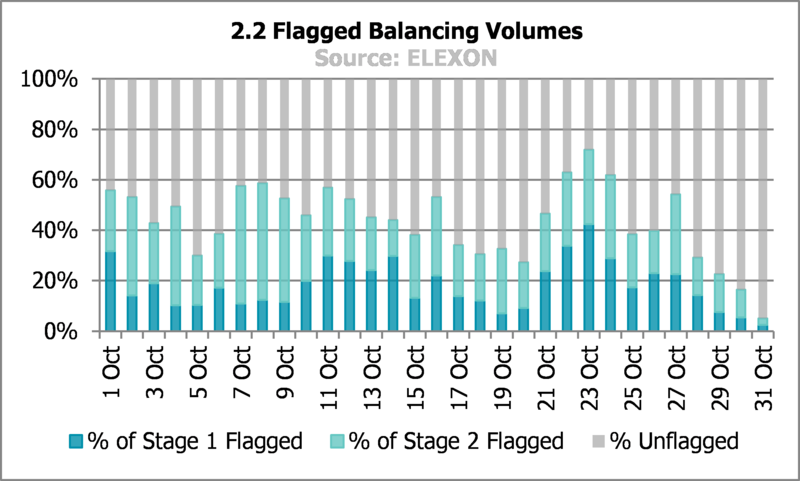 On 23 October, 72% of balancing actions were Flagged by the System Operator in the System Price calculation and 30% of the actions on this day were Stage 2 Flagged and lost their initial price. Note this is all accepted balancing actions – only a proportion will feed through to the final System Price. Any Stage 2 Flagged action volumes left in the Net Imbalance Volume will be repriced using the Replacement Price. In total, 68% of sell actions in October were Flagged, with 6% of these being assigned a Replacement Price. In October, 29% of buy actions were Flagged, of which 0.4% had the Replacement Price applied.